Jicama is generally eaten raw. Can be added to a veggie tray. For a fresh appetizer, top slices of Jicama with a dollop of tuna or chicken salad, salsa or our jicama guacamole (below). Add a cool crunch to salads, pizza, tacos or sandwiches by topping with grated jicama. Can also add to soups and casseroles in same way would add other root vegetables. But the classic way to enjoy this fresh veggie is to squeeze lime juice over raw jicama slices and sprinkle them with chili powder and a pinch of salt. ONE: Cut avocados in half and remove pits. Use a spoon to scoop flesh from 3 halves; place in a medium bowl. Peel remaining ½ avocado and finely chop flesh; set aside. Sprinkle ½ tsp salt and garlic powder over avocado in bowl; mash with a fork. TWO: To bowl, add jalapeno, strawberries, jicama, onion and cilantro; gently fold to combine. Add reserved diced avocado, lime juice and remaining ½ tsp salt; gently fold to incorporate. 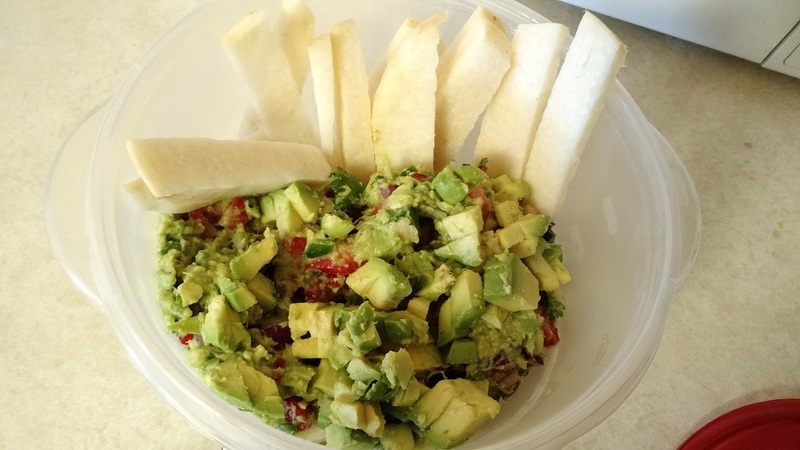 THREE: Serve with tortilla chips or crudites (such as raw jicama slices). Sift together flour, salt, baking powder, baking soda, and cinnamon; set aside. Beat eggs in large bowl; stir in sugar, oil, applesauce, zucchini, and vanilla. Add flour mixture, blending thoroughly. Spoon batter into well-greased loaf pans. Bake at 350* for about 50 minutes. Let cool in pans 10 minutes before removing.